It really surprises me how many people read these happy hour reviews. I have actually had people stop me while walking down the streets of Annapolis to tell me they read the latest one, or how much they love the series. This is even more surprising since I don’t know how they know who I am. I thought the first stranger telling me they read every one of these was a fluke, but it has happened enough times in the past few months that I have decided to write these again. So to those of you that only read the blog for these happy hour finds, thank you, and you’re welcome. 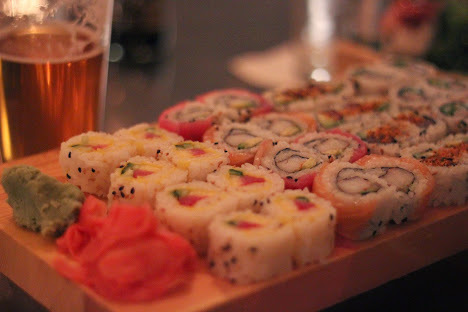 We have eaten at Tsunami several times, but never for happy hour. The food and drinks have always been great, so we decided this should be the first place to kick off the latest round of Annapolis on the Cheap. With half price-drinks, and half-price sushi, we shouldn’t have any trouble with our goal of keeping the bill under $30. Tsunami is intimate, which some may interpret as “small” but I interpret it as “an environment for making friends quickly.” Tsunami’s “happy hour and a half” is exactly that; from 4:30-6pm, Monday-Friday, Tsunami serves up half-price sushi rolls, and half-price drafts, with discounts on wine and liquor. The draft selection isn’t large, but you will always find some great offerings with a focus on local brewers. We started off with pints of Duckpin Pale Ale from Union Brewing Company. Duckpin has a strong malt base, but really relies on the heaping amounts of American and New Zealand hops that fill this beer with flavors of citrus and tropical fruit. For sushi we ordered four rolls, which came to a total of $18, an average of $4.50 each. Now how did the sushi actually taste? I would be lying if I said it was the greatest sushi I ever had, but after living in Guam for several years, and spending a lot of time in Japan, “best sushi ever” is a pretty high standard for me. However, this is by far the greatest sushi I have ever tasted for $4.50. I highly recommend the Rainbow Roll, an avocado and crab stick roll with slices of snapper, tuna, and salmon layered across the top. 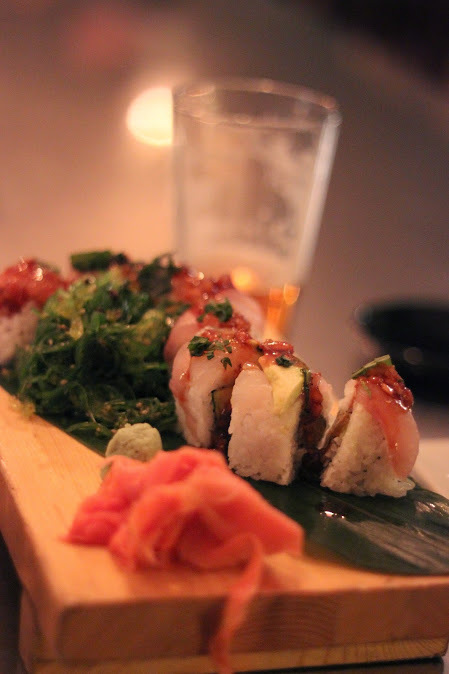 Also check out the Uptown Roll, a rather spicy roll containing yellow tail tuna, jalapeño, and cucumber. For our second round I had another Duckpin, because it’s a phenomenal pale ale and Union is an incredible brewery. However, the wife switched it up and went with Breckenridge Vanilla Porter. Seeing vanilla in a beer often makes me worried that the beer is trying to be a dessert, but Breckenridge does it right by using just enough vanilla to highlight the roasted grain, cocoa, and light coffee flavors that are in this porter. So how did we do with our happy hour challenge? With $18 worth of sushi, and $16 in beer, the bill ended up being $34 before tax and tip; $4 above our limit of $30. However, after looking over the menu again we could have ordered one less sushi roll, or we could have gone with cheaper rolls and stayed under $30. We didn’t plan properly, so even though we failed to meet our goal, Tsunami’s “Happy Hour and a Half” definitely hits the mark in terms of quality and value. I suppose we’ll just have to give this one another try with some proper planning (oh darn). Want to plan your own Annapolis happy hour? I’ve created an Annapolis Happy Hour Calendar that you can use to find all the craft beer happy hour deals around Annapolis (I recommend agenda view). You can also sync this calendar on your phone via XML (Android), or iCal (iPhone). Just keep in mind that happy hours sometimes change. The calendar will change with them, so let me know if you spot a new happy hour in town. Thanks for the recommendation Julie! I love Carroll’s Creek but I’ve never done the happy hour. I’ll have to try it out soon! I have always been happy with the happy hour here. The sushi at half price is excellent and the miso is excellent as well at $3. If you are spending more the Seabass soup is exclent! One of our favorite places! I see some places missing from the Happy Hour calendar- do you have a requirement for how many craft beers on the menu or something? Hi Jaime! I always tried to keep places on the calendar that had a decent beer selection. However, I’m currently living in Europe (writing you from a Barcelona craft beer bar) so I’m not keeping up with Annapolis as much as I used to. Maybe there will be updates when/if I return. Or perhaps someone would like to takeover the calendar and happy hour challenge in my absence?